Twentieth century continental thinkers such as Bergson, Levinas and Jonas have brought fresh and renewed attentions to Jewish ethics, yet it still remains fairly low profile in the Anglophone academic world. This collection of critical essays brings together the work of established and up-and-coming scholars from Israel, the United States, and around the world on the topic of Jewish religious and philosophical ethics. The chapters are broken into three main sections – Rabbinics, Philosophy, and Contemporary Challenges. 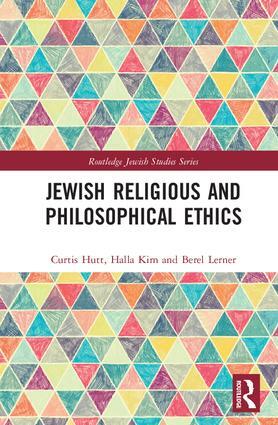 The authors address, using a variety of research strategies, the work of both major and lesser-known figures in historical Jewish religious and philosophical traditions. The book discusses a wide variety of topics related to Jewish ethics, including "ethics and the Mishnah," "Afro Jewish ethics," "Jewish historiographical ethics," as well as the conceptual/philosophical foundations of the law and virtues in the work of Martin Buber, Hermann Cohen, and Baruch Spinoza.The volume closes with four contributions on present-day frontiers in Jewish ethics. As the first book to focus on the nature, scope and ramifications of the Jewish ethics at work in religious and philosophical contexts, this book will be of great interest to anyone studying Jewish Studies, Philosophy and Religion. Curtis Hutt is Associate Professor of Religious Studies at the University of Nebraska at Omaha. His Ph.D. is from Brown University in Religion and Critical Thought. He works primarily on the ethics of the representation of the religious past with a focus on the history of Judaisms and Jerusalem. Halla Kim is Professor of Philosophy at the University of Nebraska, Omaha, USA. He specializes in Kant/German Idealism, modern Jewish thoughts and Korean philosophy. He is the editor (with Steven Hoeltzel) of Kant, Fichte, and the Legacy of Transcendental Idealism (2014). Berel Dov Lerner received his PhD in philosophy from Tel Aviv University. He is an Associate Professor of philosophy at Israel's Western Galilee College and has authored the book Rules, Magic, and Instrumental Reason (Routledge 2002) and many articles in philosophy and Jewish studies.